Seen from a distance, the Temple of Confucius in Qufu, Shandong province, encircled by a magnificent red wall capped by glazed tiles and with delicate turrets at the four corners, looks somewhat like the Palace Museum (Forbidden City) in Beijing, which was the seat of the Ming (1368-1644) and Qing (1644-1911) dynasties' emperors. The Temple of Confucius showcases the importance and uniqueness of architecture in times when the style of imperial palaces was not to be replicated by any other building. 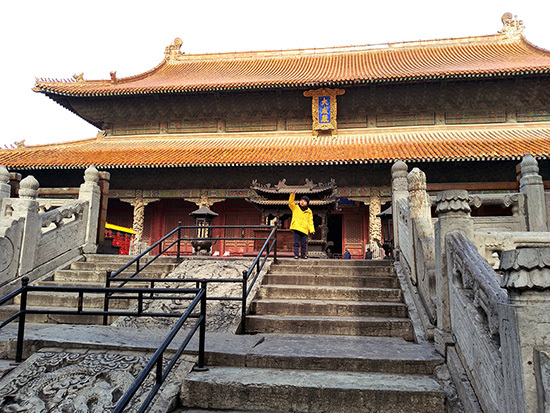 Which means the Temple of Confucius was the only complex allowed to employ the royal construction style. The main hall of the temple- or Dacheng Hall, which is basically a wooden structure 32 meters high, 54 meters long and 34 meters wide perched on a 2.1-meter-high white marble plinth - is one of the three largest halls built like an imperial palace hall similar to the Forbidden City's Taihe Hall and the Tiankuang Hall of the Dai Temple in Taian, a city about 100 kilometers north of Qufu in Shandong. The Temple of Confucius is a tribute to Confucius (551-479 BC) - the most influential ancient Chinese philosopher and founder of Confucianism. The temple's construction began during the Lu Kingdom (1043-249 BC) in Qufu, where Confucius was born and spent most of his life, in 478 BC. The emperors of many dynasties bestowed on Confucius posthumous titles, and the temple was expanded and renovated by almost all the imperial dynasties since then, making it the largest temple in China where Confucius is worshipped. Spread over 327 mu (22 hectares), the temple is made up of nine courtyards connected from south to north. It has a total of 464 halls, pavilions, gates and memorial archways. Except for some stone tablets, most of the buildings were rebuilt during the Ming and Qing dynasties. Historical records show the temple has undergone 15 major repairs and renovations over its more than 2,000-year history. The temple underwent its last major restoration in 1970 to repair the damage caused by the Red Guards in 1966 at the beginning of "cultural revolution" (1966-76). And the annual ceremony of worshipping Confucius on his birthday resumed in 1984. The ceremony - now an intangible cultural heritage due to its intricate rituals - has evolved into a grand cultural event drawing the attention of people both at home and abroad owing to the influence of Confucianism, and the government is intent on making it a platform to unite Chinese people around the world. With the Dacheng Hall as the center, the temple is characterized by a bilateral symmetry on a south-north axis. There are five halls, one memorial temple, one tower, one altar, 17 pavilions for stone tablets and 53 memorial archways in the complex. Most of them owe their name to literary quotations eulogizing Confucius or the legends woven around him. For instance, the only altar in the temple is called Xingtan, where Confucius is said to have delivered lectures to his students throughout most of his life. Some schools today have buildings, departments or activities named after Xingtan to pay their respects to Confucius and his contribution to spreading the spirit and principle of benevolence, righteousness, courtesy, wisdom and trust. The layout of the complex was designed according to a series of ethical and ritual theories created by Confucius, who emphasized social hierarchy and harmonious co-existence of human beings and nature, making it a combination of space and spirit, and nature and culture. 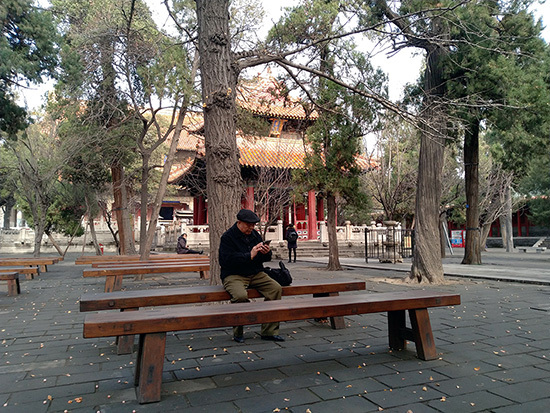 There are hundreds of old trees and over 2,000 stone tablets in the temple complex, with the oldest one dating back to the Han Dynasty (202 BC-AD 220), which enshrines the imperial praise for Confucius. A number of tablets are valuable cultural relics, and important to history and calligraphy students. The Temple of Confucius, and the neighboring Kong Family Mansion and Cemetery of Confucius were recognized as world cultural heritage by the United Nations Educational, Scientific and Cultural Organization in 1994. The Chinese government recognized the three places as a key cultural relic site under State protection in 1961.